I am an advocate for Down syndrome. I am an advocate for international adoption. I am an advocate for international adoption of children with Down syndrome. Although Lydia is just 11 years old, it seems we have a lot in common. She has two siblings that have Down syndrome ... one biological and one adopted. And she loves them with every ounce of her soul. Seven days ago, Lydia spear headed The Darya Project. Darya is an orphan in Eastern Europe. 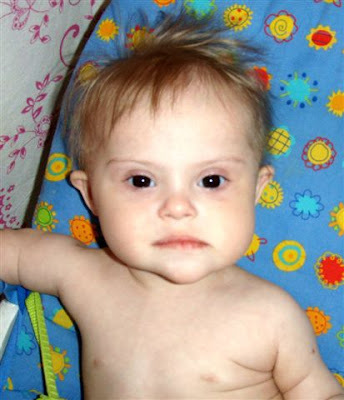 She has Down syndrome and she is waiting for her forever family. Is she not the cutest little thing?! The Darya Project is Lydia's mission to raise $20,000 by Thanksgiving to fund the adoption of Darya. Lydia has fallen in love with little Darya's picture. She made a pact with her parents that if she could raise the money to fund Darya's adoption, then they would adopt her. If 200 people donated $100 each, she would meet her goal. Or even if 600 people donated $33 each, she would meet her goal. Even $5, $10 or $15 donations go so much further than you think! When you consider all the people in this world ... and all the people that are reading these words ... is it really that inconceivable? I don't think so ... and I'd love to see it happen. So far, Lydia has raised $7,021 in seven short days. She has had a car wash, three bake sales and a Christmas picture day ... and she has more planned! PS ... please spread the word! Click here to read more about Lydia and her family. Monetary donations can be made by clicking on the paypal icon in the upper right corner of their blog. Awww...makes my heart melt when young ones "get it". I pray she meets her goal! $7k in 7 days!?!? Phenomenal. I think that Darya looks like Jamie's Amelia. WOW-thanks sooooo much for letting me (us) know about Darya and Lidia. She just HAS to meet this goal-how could anybody NOT help her? I will forward this on to all my firends with big hearts! I am so excited you wrote about me on your blog. I can't believe you are the Bubba, Chicky, and Nika blog. I found you a few weeks ago and loved your blog. Your kids are so cute. We have a lot in common. Thank you for your help to spread the word about Darya. What an amazing girl! Thanks for letting us know about her and her mission! Darya is such a cute little girl! I just donated and can't wait to see (I am now following their blog) Darya home with the Hollis family! Thanks for letting us know about this!!! AWESOME!!! Thanks for posting about Lydia and Darya!! Thank you so much for sharing this! Hoping and praying she reaches her goal!